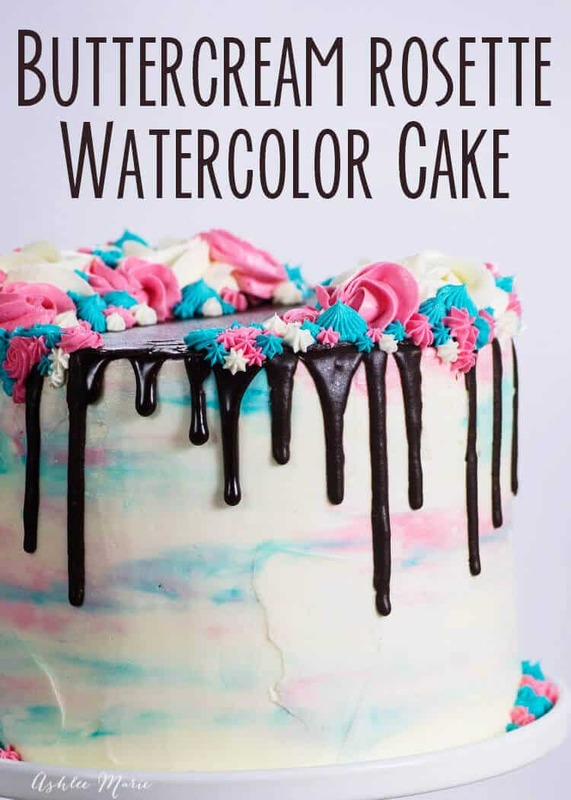 After you have the cake frosted in white add spots of blue, pink and white frosting around the cake and then smooth one final time – DO NOT over smooth this or you’ll either wipe all the color OFF or your intermix them too much and create colors you aren’t looking for. For the ganache drips you want to do a 1:1 ratio of chocolate and cream vs the normal 2:1 ration I use for ganache frosting. Then I started with the largest rosettes (in white) then worked my way down in size, filling in holes and gaps as needed with smaller tips. I make all the rosettes out of the pink and white, leaving the blue for the drop tip flowers and stars – but you could totally do blue rosettes if you want. I’ve attended a lot of gender reveals and my one piece of advice – if one of the parents has their heart set on one gender and might not react well to the other than DON’T surprise yourself in front of everyone you know and love. Find out privately then share when you are ready to be happy either way. Just my 2 cents! Salute to you mam! Looking forward for more recipes and cake decorating tutorials..God bless you more..
thank you so much! I appreciate you taking the time to leave a sweet note! 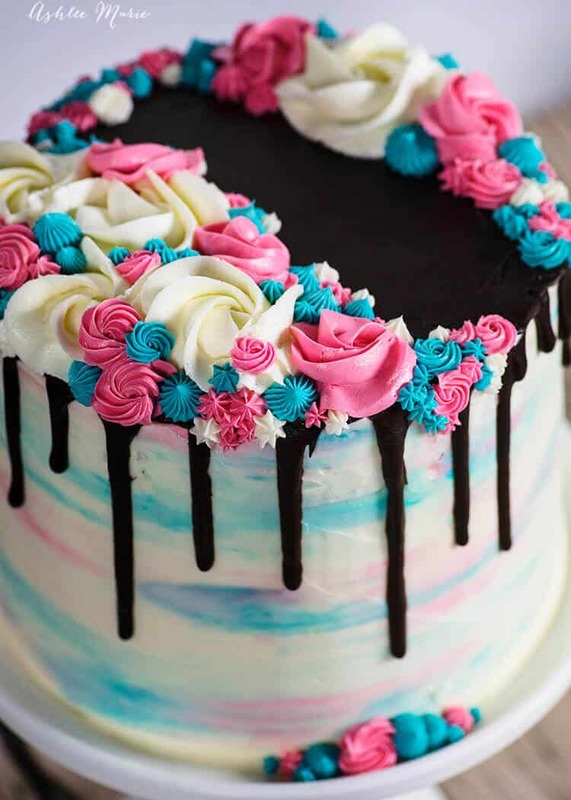 I tried the Buttercream Rosette watercolor cake.. It turned out beautiful.. Thank you so much..
you are so very welcome! if you share a picture on social media tag me so I can see it! I was recently wandering through the Wilton site and came across some water colored fall leaf cookies. I immediately fell in love. I have painted cookies with frosting but sometimes it’s hard to get the effects you want. When I inquired about this technique Wilton had little to offer. They knew next to nothing about the painting. I have MS and don’t drive. There is no place here in Watertown, WI. to learn this craft. All they knew was it was done on Royal Icing (which I don’t care for). Was excited to see the gels used in your cake. Beautiful (as always) cake. Wish me luck I am going to do those cookies come hell or high water! You just showed me it will work with other frostings. Thank you for showing all your wonderful creations. You DO inspire others. Best wishes! Barbara Karr. you are so welcome! it’s all about finding the right medium to add the gel’s too. If you use a frosting that crusts over you might only need water vs food grade alcohol. while the fondant needs something to “eat” through it, since water makes it just slimy… Good luck! 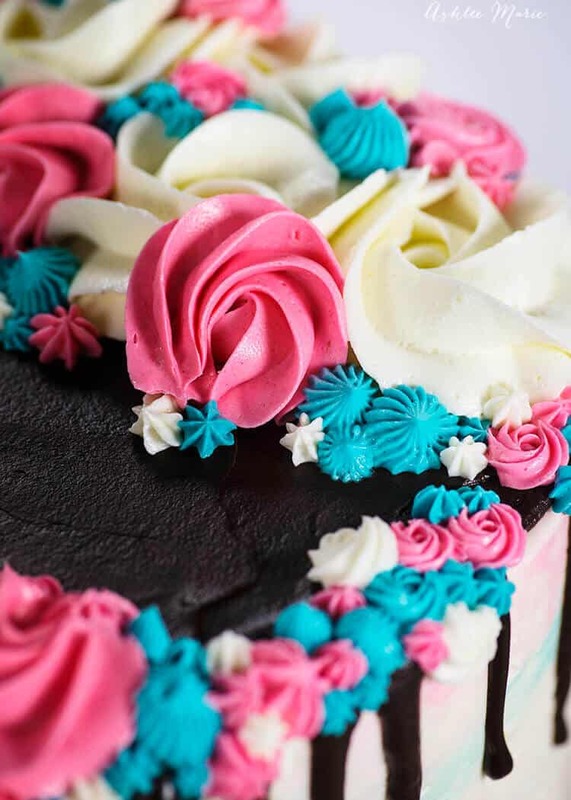 What tips do you use to decorate this beautiful cake? My daughter wants me to make this for her friend. just a whole bunch of of closed star tips in various sizes, and a small french start tip.